Defibrillation is a process in which an electronic device gives an electric shock to the heart. This helps reestablish normal contraction rhythms in a heart having dangerous arrhythmia or in cardiac arrest. In recent years small portable defibrillators have become available. These are called automated external defibrillators or AEDs. It’s essential to integrate early defibrillation into an effective emergency cardiovascular care system. This means employing the five-part “chain of survival” concept. Immediate recognition of cardiac arrest and activation of the emergency response system — quickly calling the Emergency Medical Services (9-1-1) system. Early cardiopulmonary resuscitation (CPR) with an emphasis on chest compressions — promptly giving cardiopulmonary resuscitation when needed. Order a CPR Anytime Kit. 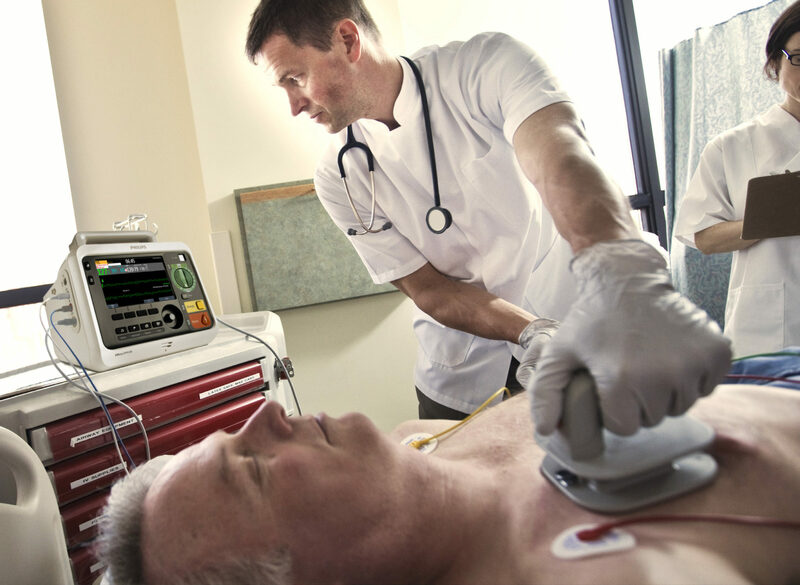 Rapid defibrillation — having proper equipment and being trained to use it when indicated. Effective advanced life support – including airway management, ventilation support, and treatment of rhythm disorders. Integrated post-cardiac arrest care – a comprehensive, structured, integrated, multidisciplinary system of care should be implemented in a consistent manner. An ICD is a battery-powered device placed under the skin that keeps track of your heart rate. Thin wires connect the ICD to your heart. If an abnormal heart rhythm is detected, the device will deliver an electric shock to restore a normal heartbeat if your heart is beating chaotically and much too fast. ICDs have been very useful in preventing sudden death in patients with known sustained ventricular tachycardia or fibrillation (View an animation of an ICD). Studies have shown that they may have a role in preventing cardiac arrest in high-risk patients who haven’t had but are at risk for life-threatening ventricular arrhythmias. Because many people do not understand their underlying condition – such as heart failure or genetic predisposition for risk of sudden cardiac arrest – and because ICDs are used primarily for prevention, they in turn may not understand the benefits versus the limitations of having an ICD implanted. How is an ICD implanted? A battery-powered pulse generator is implanted in a pouch under the skin of the chest or abdomen, often just below the collarbone. The generator is about the size of a pocket watch. Wires or leads run from the pulse generator to positions on the surface of or inside the heart and can be installed through blood vessels, eliminating the need for open-chest surgery. It knows when the heartbeat is not normal and tries to return the heartbeat to normal. If your ICD has a pacemaker feature when your heartbeat is too slow, it works as a pacemaker and sends tiny electric signals to your heart. When your heartbeat is too fast or chaotic, it gives defibrillation shocks to stop the abnormal rhythm. It works 24 hours a day. New devices also provide “overdrive” pacing to electrically convert a sustained ventricular tachycardia (fast heart rhythm) and “backup” pacing if bradycardia (slow heart rhythm) occurs. They also offer a host of other sophisticated functions such as storage of detected arrhythmic events and the ability to perform electrophysiologic testing. Stored information can help your doctor optimize the ICD for your needs. If you have an Implantable Cardioverter Defibrillator, be aware of your surroundings and the devices that may interfere with its operation. Potentially disruptive devices include those with strong magnetic fields. The longer you are exposed to the potentially interruptive device and the closer it is in proximity to your ICD, the more likely it will affect your ICD’s performance.